cat eyes & skinny jeans: Coined! Darlings it’s common knowledge that a handbag is an extension of a woman’s personality. If it wasn’t, I hardly think we would deem it necessary to search high and low for one with the capability of working with each and every item of clothing we think worthy of covering our bodies. How is it then that we spend a countless amount of time choosing our purse du jour, yet seem to forget the importance of a cute and compact hiding place for our change? Oh, I’ll admit it, there’s nothing I adore more than spare change – it’s always at your beckon call when you need an extra penny for your daily Light White Chocolate Mocha Frappuccino, or a few quarters to keep the meter maids at bay; but I absolutely refuse to have stray coins littering the bottom of my handbag like a virtual moneyed garbage dump. In the words of Benjamin Franklin, “A place for everything, everything in its place”; thus, I’m about to get coined! Coach “Poppy Mini Turnlock Coin Purse” I really see no better way to celebrate the loveliness of handbags than by investing in a petite coin purse that is the spitting image of one a la Coach’s Poppy Mini Turnlock Coin Purse. While only five-inches in length, the spearmint shade packs enough punch to add a splash of pizzazz to your assemblage of accessories; but even better than the minty pigmentation is the very vintage, almost Stam-inspired chain-link strap and corresponding turn-lock closure which add a hint of Mad Men magnetism to the very modest design. Stash it in your handbag for easy access to loose change, or don it as a wristlet during your momentary mad dashes into the druggist for an emergency bottle of conditioner. Either way you’ll find yourself inseparable from its patent leather lure. Rumor “Mini Coin Case” Attribute it to my own small stature if you’d like, but I’ve always found myself incapable of resisting teeny tiny novelties which prove that yes, good things do come in small packages; case in point Rumor’s Mini Coin Case. Available in a multitude of shimmering colors, from gold to lilac and silver to pink, the Mini Coin Case is the bearer of gold-tone hardware which contributes a very understated type of elegance to the design; a type of polished charm that, in my mind, only makes the diminutive parcel even more covetable. Figure in the fact that each slight receptacle costs a mere $17.50 apiece, and I see no harm in indulging in each color available – to match my mood of the day, to be sure. Just remember, like those miniature 3 Musketeers bars we devour each Halloween, the Mini Coin Case is, above all else, fun size! Fontanelli “Red Mouth Coin Holder” Alexander McQueen’s Fall 2009 Collection frightened me as it made its way down the runway. It was not the clothes that left me in a slight state of terror, mind you, but rather the white faces and ballooned red lips of the models wearing them; a juxtaposition between high fashion and the wacky worlds crafted by Tim Burton. Once the initial shock wore off, of course, it was replaced with intrigue; an intrigue that was long forgotten until I laid eyes upon Fontanelli’s Red Mouth Coin Holder. Kittens, what better way to pay tribute to Alexander McQueen’s genius than by permitting the Red Mouth Coin Holder to stowaway in your handbag? The red patent leather seemingly shimmers and shines in the same fashion that the over-painted red lacquer lips glinted on the runway; while the complete outline of the versatile vestibule ostensibly smirks up at you in the most mischievous of ways. This is one kitschy coin purse that receives my wholehearted kiss of approval. American Apparel “Shiny Coin Purse” It’s obvious that magpies and I would quickly slip into a very close friendship based solely on the fact that we both adore shiny things, and collect them as if they’re going out of style. 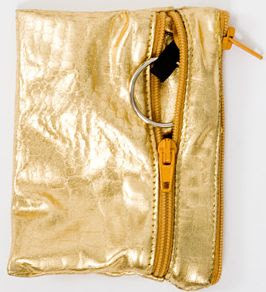 While I typically prefer the type of shiny things that you can slip around your fingers, however, I am more than willing to try a different type of sparkle on for size in the form of American Apparel’s Shiny Coin Purse. Hand it over to me in the Boa Gold, Boa Black, or Lame Gold. Between the available colors, foldable construction, dual zippers, and unbeatable price, I find the complete package capable of giving me the most splendrous shivers up and down my spine. And if it’s accommodations are large enough to allow a credit card or two and a set of keys to cohabitate with our change; well now, is it really our place to complain? 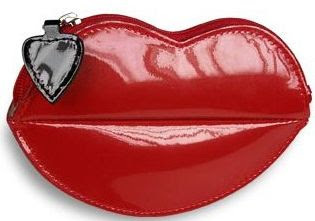 Lulu Guinness “Double Kiss Mini Frame Purse” Cute boys may find it downright embarrassing to maneuver city sidewalks with red lips imprinted on their cheeks; but I’ve always found the picture so enchanting and endearing – like a rumpled Casanova that has just walked off the set of an Old Hollywood film, screaming girls tearing at his clothes as they scramble in their handbags for a stray pen and paper for him to scrawl his autograph on. Oui, its true mes chéris, that is the precise scene that played out in my mind when I spotted Lulu Guinness’ Double Kiss Mini Frame Purse. The black satin and silver kiss-lock closure provides the sophistication which girls always strive to expel; while the dual embroidered red lipstick kisses serve as a flirty, coquettish type of playfulness – a devilish wink, of sorts. I suppose I can’t be sure as of yet; but I have a hunch that I won’t be able to keep quiet about this oh-so kissable coin keeper! Ready to get coined, kittens? Thanks to Macy’s, Rumor, Forzieri, American Apparel, and Lulu Guinness for the pictures. Don't forget to enter the Velvet Rope Giveaway for your chance to win a pair of Members Only Stretch Velvet Leggings from Chickdowntown. OMG these are all so adorable... I am so smitten with that Coach one! Isn't everything from Coach Poppy so cute?! I have a little silk pouch here at home for my laundry quarters (handicraft from a Thai street fair), but I usually put nickels, dimes and pennies in change jars everywhere... I carry enough in my handbag as it is! lovely coin purses esp. that coach one on the first photo!!! i love this post!! coin purses are so cute, and kind of essential when u think about it. love all of your picks!! Double Kiss Mini Frame Purse is fabulous!!! love the first one, the colour + the shape, it's really fantastic! Hope you've had an amazing weekend! I adore the lip shaped one. Coin purses always look really cute! I don't have a coin purse...yet, but theres always tomorrow! I need a new coin purse...these are all so cute. As a fan of the oversized purse I am always looking for ways to keep things compartmentalized. These are great - and so many unique options! that coach bag is so vair vair keoute . I like the rumor mini coin case, in pink of course! ooh i have the AA wallet :) haha so cute! I have a black wallet that I love from my sisters- I would never dream of using anything else! Love that Coach one! It's so cute! Such a lovely color as well! You had me at the lips. How freaking cute is that McQueen? LOVE! my coin purse was an absolute LIFE saver while in London studying abroad. they use so much change in europe & it helped me keep track of my subway pass! I love that McQ! How fun! 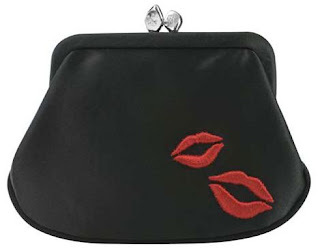 I do adore the double kiss purse! the coach coin purse is SO cute!!!! I have more coin purses in my bigger purse than the average person should. One for punch and discount cards, one for change and one I use when I need to just carry my credit card and ID. I just can't help myself! I just got an adorable mini coach clutch with the perfect fall shades of purple for my birthday! I am loving the Rumor mini coin case! very cute coin purse. i love the green one and the lip shaped one. What a gorgeous turquoise bag! Wow. These are all beautiful. I really love that first one. I hope you have a fantastic week. Take care. Cheers! Coin purses are just so cute. My favorite is the Coach one! I love the color. aw, these are all so cute. You are darn right when you said "We search high and low for handbags to go along with our outfit..."
I love all these coin purses, especially the McQueen one. So fabulous! LOVE this post! That Coach mini bag is so cute and how funny, I got my roomie one of the Deux Lux zippered pouches for her bday, haha. Hm weird, just looked- the Deux Lux one I thought is actually by Rumor. LOOKS EXACTLY THE SAME haha. Ooh all of these look delicious :D Love it! Those look cute. But I always end up with a wallet that has a coin compartment. The Coach one is so cute! I love turn-lock purses. these are all so cute!!! I love the lulu purse with the kisses how cute! You always have great finds.